Adobe has announced a new "self-service" technology that it claims is the industry's most advanced programmatic ad platform for advertisers and media publishers leveraging fully integrated solutions in Adobe Marketing Cloud. The technology, which is part of Adobe Marketing Cloud and Adobe Media Optimizer, lets advertisers take direct control of automated ad buying for search, display and social media across ad exchanges and media networks. Adobe said Google, Facebook, Yahoo, Rubicon Project and Index Exchange are among its media-network partners. The platform aims to provide "full transparency into media costs, ad performance and revenue" and will be integrated with Adobe’s analytics and audience manager. "Transparency is the key to success in the programmatic world, as automation is rapidly defining the buying and selling of digital ads," Justin Merickel, senior director of advertising solutions at Adobe, said in a release. "Advertisers are demanding more real-time insight into campaign spend and ROI." Global programmatic ad spend is expected to reach $53 billion by 2018, according to Adobe, which said it is focused on integrating disparate technologies and "delivering programmatic capabilities in a unified platform." A holistic view of Adobe's digital marketing offering. Adobe also announced its programmatic offering for media publishers, broadcasters and pay TV as a beta. 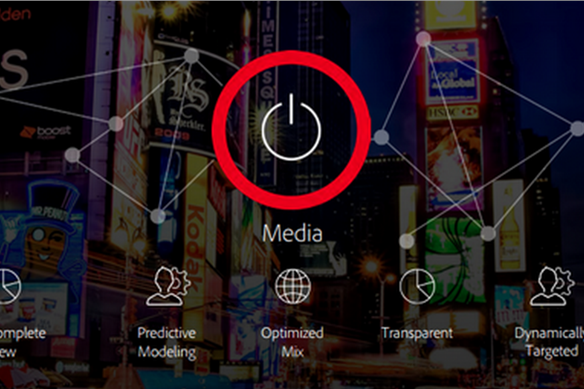 Adobe Primetime offers media sellers the ability to sell video ad inventory across screens. "Adobe is addressing some major industry pain points with its programmatic platform from connecting technology and data siloes to solving for scalability and transparency across campaign channels," said Stephan Beringer, CEO of the VivaKi Operating System (VOS). "It’s increasingly difficult to track when, where and how digital ads are performing, but marketers are demanding more accountability."